Workglue field service software streamlines scheduling, lead management, and enables real-time management of field personnel and assets. Despite the abundance of technology at business owners’ fingertips, too many of today’s companies rely on outdated methods to schedule employees, manage projects, and track expenses. Maybe this is a paper calendar taped to the side of a filing cabinet in the office, perhaps it’s a Google calendar shared with all the staff. While these methods may suffice, they don’t really go above and beyond the way Workglue does. Workglue is a field service software designed to streamline management tasks. Within one platform, business owners and managers can schedule jobs, handle their teams, and more. Workglue integrates seamlessly with QuickBooks, small business owners’ first choice for computerized accounting. The software even offers analytics, so managers can generate easy-to-read charts and graphs that illustrate their companies’ conversion rates and other statistics. Workglue holds all of the complicated management parts of doing business together to boost efficiency and eliminate the loss of goals and data. Funnily enough, it wasn’t always the Workglue founders’ intention to create the software. John Busick, a workflow and customer service guru and the company’s expert home service provider, is the CEO of his 5th generation family painting company Bob Kunst Painting Inc. out of California. Robert Stoeber is a serial entrepreneur and a tech consultant with years of experience working with businesses of all sizes. It wasn’t until Robert received a phone call from a Virginia painting company—and then another from a painter in Nevada, and then the same from California—that he and John realized there was a dire need for field service software that wasn’t yet being filled. They first created software for the companies who’d asked for it, but last year they began selling Workglue to businesses across the country. Their potential customers now range from home healthcare providers and construction companies, to housekeeping and landscaping businesses. “Workglue is our attempt to help them manage all the information in their business, from sales leads that come through their websites to scheduling,” says Robert of Workglue’s customers. But that doesn’t mean every company uses Workglue in the same way. Instead, the software is flexible enough to be used the way a business needs. For instance, one business might need to focus on lead management and creating estimates, so they’ll use Workglue primarily as a sales management tool. Another might need something that tracks workers’ hours and schedules their shifts, which turns Workglue into more of a scheduling apparatus. Finally, some customers love it for document management: the software can hold and organize blueprints, photos, videos, and text documents. Now that Workglue has a considerable customer base, the founders are focusing on tweaking and perfecting the product. Robert and John pay close attention to the way customers use the software so they can make proper adjustments and further boost efficiency and ease of use. Though Workglue mobile application exists, it currently can only be used for time tracking; the founders intend on expanding the app’s capabilities in the near future. They also hope to further the software’s integration with QuickBooks and popular payroll systems in the coming years. Scott Kennedy, CEO of Puente-Romer Communications, in Montclair New Jersey has been working with Robert Stoeber for 25 years. “Robert has been instrumental in shepherding all three of our business entities along the technology and efficiency paths for nearly three decades now. We have enjoyed access to his various tools and industry expertise as needed. 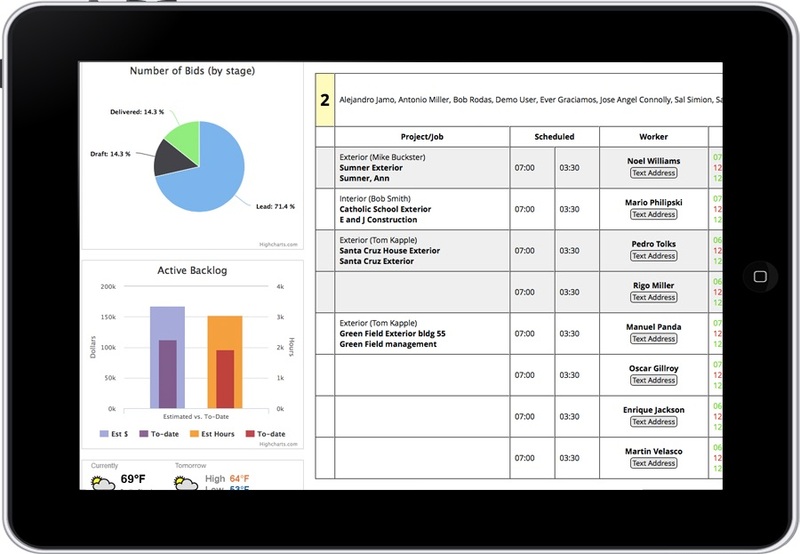 While we do not have teams of technicians in the field, I can see how rolling up all the elements into one unified dashboard would be a huge time and cost saver to any firm that does have teams in the field”. Primarily, the ability to have all the team members; management, accounting, technicians, customer service and sales all working separately but using the same data in real time will be the competitive edge that will set the business ahead of its competitors. Being able to deploy or re-deploy company assets in minutes rather than days is where the future lies. I predict that Workglue and this new way of doing business will be an inevitable business transition that we will need to adapt to or lose market share. If your company struggles with scheduling, time tracking, document management, and other essential parts of the business, it would probably benefit from using Workglue. Feel free to reach out to Robert and John by emailing them at info@workglue.com and visit https://workglue.com/ for a free trial.